May 27, 2014 Conversation Starters: Are You Watching It Takes GUTZ To Be A Gutierrez? + More! 1 Move over, Kardashians. The Gutierrez family is taking over Asia in their new E! reality show, It Takes GUTZ To Be A Gutierrez. 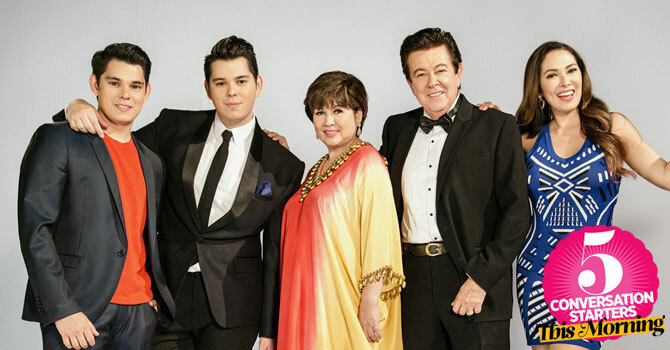 The six-episode series follows the daily life, controversies, and issues of Eddie, Annabelle, Ruffa, Richard, and Raymond as they deal with the ups and downs of showbiz life. From pregnancy rumors and failed marriages to issues of insecurity and jealousy, the Gutierrez clan shows us what it really means to have "gutz." The series premieres on Sunday, June 1 at 9p.m. on E! (Sky Cable and Destiny Channel 57, Cignal Channel 25, and Cablelink Channel 33). Watch the teaser ad below, and let us know what you think!